I’m not the only one who complains on social media about having the ‘cabin fever’ at the moment. The gray weather and lack of sunshine wear me down, with other words, I haven’t used my camera much outdoors lately. The time with daylight is still short and there isn’t much light left after work if the sun is hidden behind a thick layer of clouds. Well, we expect some snow here in the next couple days and maybe that will be a game changer. I love shooting in the snow. 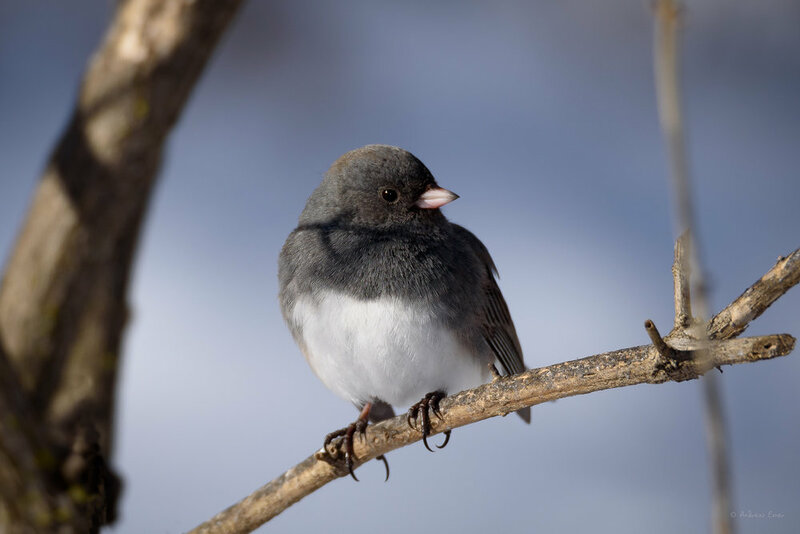 The good part is that I have time to re-organize my photo library, a project I want to get done before spring arrives, and that’s where I came across this picture of a Dark-eyed Junco in the beautiful light of a clear winter day. Speaking of social media, I started to share some of my photos on Instagram. You can find me there @exnerimages . This is another way to fight the ‘cabin fever’ and get inspiration from other photographers and all kinds of creative people.